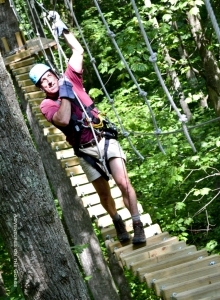 A guest walks a course through the trees at AOTG. Adventures on the Gorge will unveil thirteen new mid-range guest cabins on the New River Gorge by Memorial Day weekend, according to Dave Harvigsen, CEO for the outdoor-adventure resort company. Seven cabins with two units and six cabins with one-bedroom suites are now being finished at the resort’s Mill Creek campus high above the New River and adjacent to the New River Gorge, he said. The Amish-built units will feature king beds, desks, televisions, and bathrooms with step-in showers and will include pull-out sleeper couches in living rooms. The cabins are currently under construction at the builder’s factory, where the controlled environment allows for minimal waste and increased efficiency. The cabin walls are built using structurally insulated panels with high insulation ratings, Harvigsen said. The new accommodations are being named “Kaymoor Cabins” and “Kaymoor Cabin Suites” after the ghost town located not far from the resort. Rates will be $169 for the single-bedroom units and $189 for the suites. “These cabins will fill a need for mid-range accommodation, and, with our new conference center up to full speed, corporate and leisure groups on a budget will still get the privacy and amenities they seek,” Harvigsen said. Adventures on the Gorge, also known as AOTG, offers a wide range of accommodations for individuals and groups with varying budgets. Individual and group campsites are available for guests in search of a no-frills experience while various multi-bedrooms cabins, single-room units, suites, bunk cabins, tent cabins and luxury houses add up to a full menu of choices for individuals as well as meeting groups, leisure groups and family reunions, he said. To reserve a Kaymoor Cabin, Kaymoor Suite, or another accommodation, call 1-855-379-8738. More information is available at AdventuresontheGorge.